Hotel Overview PERUN hotel offers - 3 stars luxury summer vacations. The hotel is on the south beach of Nessebar (the new town region). 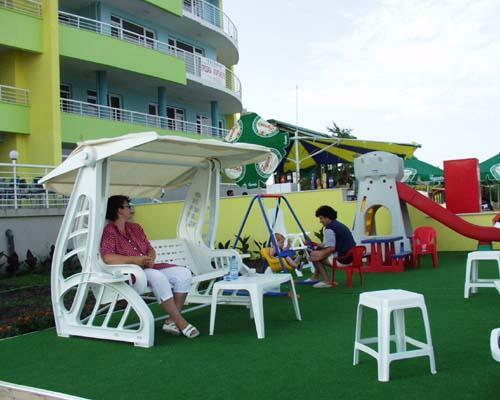 The hotel has 4 floors, an elevator, restaurant, lobby-bar, children's play-site, summer terrace, underground parking place, safe. Facilities Each room and apartament has its own WC, phone, TV set (cable), mini-bar, room-service. Hotel Address Perun Hotel is located in Nessebar, Bulgaria. Do you have swimmingpool at your hotel? Could you please send me some more information about your hotel about all inclusive prices for one person in double room between 28 July and 3rd August, and about facilities in your hotel. Can you please send prices about double and 3-bed rooms? Or do double-bed rooms have a spare bed? We would like to go to Sunny Beach in early September. 5 people. Can you tell us more about breakfast/dinner, swimming pool. How far is the hotel from the old town?